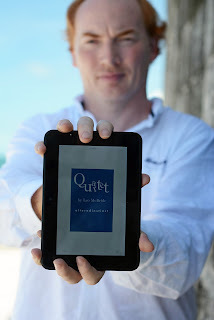 The blog catches up with... the writer of the blog in this Q&A with Leo McBride, pen name of Stephen Hunt, to ask a few questions about Quartet, his collection of short stories published earlier this year through Amazon and available on Kindle. It seems wrong to welcome you to your own blog but... welcome! Back in August, you took the step to become a published author, with your self-published collection of short stories, Quartet. How did that come about and what was your plan with regard to publishing at that time? Thanks. And honestly, I'm not sure anything could necessarily be said to fit the word plan - if I could borrow a line from Indiana Jones, then at the time I would have shrugged and muttered "I don't know, I'm making this up as I go along!" At that time, a few other aspiring writers and I were working on creating a compilation of short stories, Tales From The Tavern, all with a fantasy leaning (about which more here - Ed). Now, while I've done editing work and ebook creation in the past, and we were all very vocal with regard to how one another's work could be tightened and improved, what was missing from our knowledge pool was the actual nuts and bolts process of publishing the book on Amazon, and it occurred to me that the easiest way to do such a thing was... well, to just do it. I didn't want to do that with someone else's work, so I decided to pull together a few of my own short stories and, thus, Quartet was born. It was a fairly straightforward process - very enjoyable too at times. The excitement of waiting to see it appear for sale was palpable! So was it just finding stories you had available or was there a process to picking the stories you included? There was a definite process. They're all short stories, so I'm obviously a little hesitant at giving too much away about each of them for people who haven't read them, but I'm sure I can hint a little without too much worry! While each of them is standalone, I regard them all as linked thematically in some way to the first story in the compilation. That story sees an old man and a young boy in a semi-fantasy setting during an encounter that is important to them both for very different reasons. It's a piece where it gave me a chance to examine issues of trust, expectations and perceptions, loyalty and friendship. The second story, The Grandfather Clock, expands on the connection between different generations, while the third, about a photographer looking back through his catalogue of images and questioning what it was he had actually captured on camera, again looked at perceptions. The final story, Percy, brings the fantasy context to a modern setting, and while it's the least connected to the first by thematic link, to me it feels closest in spirit to the opening. I want to come back to Percy too, revisit him and see where else he'll take me. They were all short stories I'd written over a period of time, so there wasn't anything new I wrote specifically for the release, rather I cherry picked ones I personally liked and that felt right for the anthology, if that makes any sense. Certainly it does - so what has the reception been like? That's the hardest thing about this process! Everything people have told me has been good, but it's been tricky to encourage people to leave reviews, so I'm grateful for all who do! And, you know, as a new writer, you're putting your material out there and you don't know for sure how much people are really meaning what they say about your work or if they're just being polite. All the second-guessing you do of yourself is torture! But people have spoken to me specifically about elements of the stories and what they liked, and wanting to know more, and wanting to read what happens next, which is, I guess, the perfect reaction you want from someone. Always leave them wanting more... who was it said that? Barnum? I'll take a dose of that medicine. But y'know, for anyone who's read Quartet and not reviewed it yet? Just hinting there! You mentioned Tales From The Tavern, and since then there has been a companion volume, Tales From The Mists, which also featured one of your stories. So you've gone from not having anything published to having your name attached to three separate compilations inside of, what three and a bit months? So, given that, and we promised four questions rather than five so we're choosing between this and what future plans you have, what has been the most valuable part of the process to you in these three months? Well, quickly on the future plans, keep an eye on the blog! But really, I can answer a little bit of both. It's funny how your expectations and goals can change. Before August, I considered myself a writer pottering around with ideas. Thanks in large part to fellow authors from the Inklings Press compilations, particularly Ricardo Victoria and Brent A Harris, I've now already taken that step to becoming published. I can pick up my Kindle and there it is, there's my book. It never fails to amuse me that Amazon keeps recommending it to me as something I might like, though! That's always a "Well, no **** Sherlock!" moment. But having done that, I feel like I've become more focused on the end result, in working to finish at least one of the novels I've been working on with the goal of publication next year. I'm not going to get ahead of myself, one is the goal, but given the state of the stories I'm working on, it's not outside the realms of possibility that two might fit into a single year. Certainly, timing wise, one might more advantageously be published at a certain time of year than the other for marketing purposes - and that really brings me to the most valuable part of the process in the question. The biggest part of this whole process has been the learning curve, the understanding that it's not just putting the book out there and hoping things happen with it. It's hard work to put it in front of people and make them think yeah, that's worth a couple bucks of my money to read while I have my coffee. It's been great to reach out to other authors, and see how they go about doing things, what they've found that's worked, what hasn't, and hopefully that will stand me in good stead when it comes to publishing that novel! For example, some of the free stories I've put up here on the blog have been great at attracting in potential readers - but you've also got to make sure that the material you make available for free is decent stuff, that it reflects the work you do, otherwise you either put off a reader or mislead them as to your content. I've probably made that sound like more work than fun - which isn't true, it's been a great experience putting all of this together and doing it. Proof of that is that I want to keep doing it! Four questions asked, four questions answered. Many thanks! Quartet, by Leo McBride, is available in Amazon stores worldwide. For more on the anthology, including reviews and a direct link to purchase, see this blog post here. Photographs by Shawn Hanna.